Aldeburgh today in unexpected bright sunshine. We arrive past the old Moot Hall and dash to park, leaving the town behind us and scrambling on to the beach. The sundial smiles ‘I only mark the sunny hours’. Shingle shelves lead down to the water, green-brown and churning with potential. It bowls wave after wave at the shore and they foam. The wind whistles in from Holland. There are twelve of us – six adults and six children, and a splinter group makes for the waves, which charge in and pull back. It feels natural to shout at the smashing surf. One step forward, two steps back until drenched, then climb back up the bank into the lee of a gently rusting fishing boat. One of our party confides that this may be the finest spot in all of England. Surely everyone has a more than split-second thought of absconding from daily duties to ever more pad up and down the shoreline. 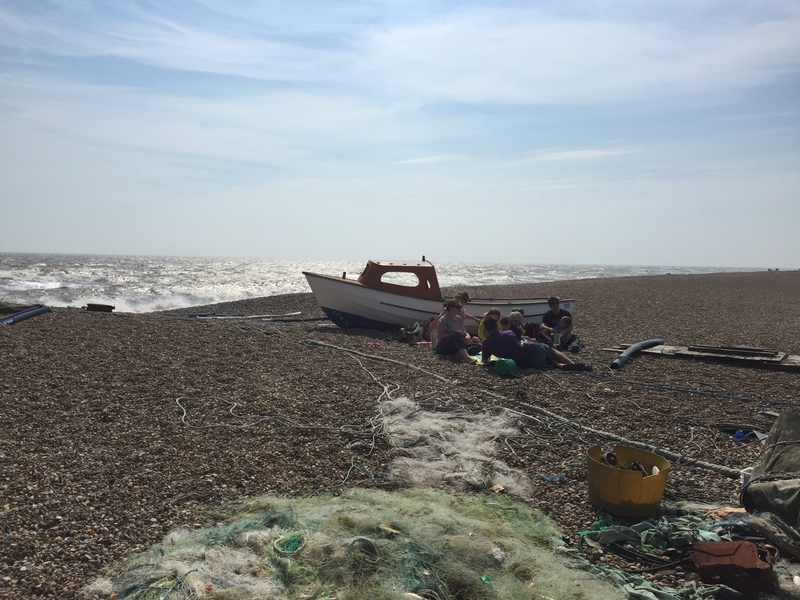 The last time I was in Aldeburgh was just before George was born, a hot summer’s weekend with the unknown racing towards us. Certainly older and possibly marginally wiser, I hope to never lose the sense of wonder at this stretch of England. It was best shared today with friends. A picnic of leftovers gets demolished. Behind us, old Aldeburgh hazes into the sunlit atmosphere, made blurry by sea-spray. Far beyond is Thorpeness’ giant golf ball, long-lost Dunwich, Walberswick. We combine efforts to make a shingle tower, pile on pile of sliding stones, then stand back and admire and then crunch our handiwork back down into the beach. Liege is not the most celebrated of European cities. Visitors to Belgium flock to Bruges, and are then surprised to find Ghent is better, that Antwerp’s station is breathtaking, and that Marvin Gaye lived in Ostend. They don’t stay on for Liege, unless they cycle. And if they cycle, then Liege-Bastogne-Liege is a name to bring chills of excitement. Less famous worldwide than Paris-Roubaix and the Ronde van Vlaanderens, LBL is one of the Spring Classic one-day races that gets Belgian people’s blood pumping faster than a special delivery of Vedette. Liege itself is a little like Sheffield. As Sheffield has the Peak District on its doorstep, Liege has the Ardennes. Suburban streets are outrageously hilly. Both are not quite post industrial, both feel real, Liege shades it for a lovely medieval centre. Sheffield probably has better cheesy chips. I’d come here to cycle out of the city, into the Ardennes, and back. Only the pro riders and those on the 273km version of the ride make it to Bastogne, by the way. For the rest of us we had Liege – Rain – Liege to look forward to. On Friday I was optimistic the rain forecast for the next day wasn’t going to come. Ascending Liege’s dramatic Montagne de Bueren, stair after stair to a superb view over the busy Meuse and the city below, I’d puffed my cheeks in the warm sunshine and thought about the ride to come. The prediction of non-stop rain must be wrong, surely? At 5am I had my answer. The rain dripped into the tiny courtyard outside my bedroom. I padded over to the other side of the flat that was my temporary home and peered hopefully out of the window. Puddles were forming on the cobbled alleyway. At this point fatalism appears through the pre-dawn murk. I was alone in Liege. I had come all this way to ride the LBL challenge. Mentally there was no way out but to stiffen my sinews and remind myself that once my are was wet it would stay wet. At least I had ignored the traditional cyclists doctrine and left my rear mudguard on. I don’t know if the Belgians eat porridge but I ate enough that morning to feed a nation of Walloons, hobbled down the narrow staircase in my cleats and then pedalled off toward the start line. In retrospect the rain and the hills blur into one. This was an unmistakably wonderful ride whatever the weather. The first few miles heading out of Liege gave way to some gentle climbs which became steeper as they wound their way into the Ardennes. Sometimes forested, sometimes threading their way between open fields reminiscent of Yorkshire, but always climbing a little further than you would think. Here are hills with bite, if not the sharp-fanged steepness of the English Lake District. At times I found myself grinning, but not really sure why, as one hill gave way to another. “Remember you enjoyed this’’ said either the devil or the angel on my shoulder, presumably in case I tried to paint the whole thing as a terrible rain-soaked mistake later on. No mistake. This was the business, and worth looking forward to all through the winter commute. There are plenty of sites out there that can more fully guide you as to what lumpy bits await on this ride so I won’t detail them all. Besides, I am slow and ponderous on my steel-framed bike, so probably no judge of the relative challenge of the hills of LBL. For me La Redoute was by far the most challenging, bringing out the primal scream just before the finish, which turned out to not even be the finish at all. By the time we were charging up the Cote de St Nicolas I was grinning even more, with plenty of puff still left in my legs. It had, incidentally, stopped raining by this point. Why does it always stop raining in the hour before you finish soggy rides? As we rolled back into Liege through the city’s post-industrial outskirts there were plenty of reasons to be cheerful. I had avoided any cramping or bonking, two clouds that got in the way of enjoying last summer’s White Rose Classic. I’d seen a large part of a whole new and very beautiful part of Europe. I’d also overtaken the annoying gentlemen who had been jumping in front of me at inopportune moments on the final descent into Liege. Most of all, from here the agenda read: home, shower, food, beer, sleep. And the home was dry, the shower warm, the food plentiful and cheap, the beer Vedette and the sleep very peaceful. Belgium for cyclists: it delivers big time. A Wednesday evening, the penultimate week of late summer hour’s at the Men’s Pond. It is raining, not heavily, enough to keep the swimmers down to a few quietly determined bathers. They stroke silently close to the outer ropes and nod acknowledgement to me as I pass. This summer has been good for swimming. Plenty of evenings like this, and while it has been warm the water has not got near the temperatures of previous years. In late August it is regaining its bite, especially on cooler days. Unlike previous years I have largely swam alone, stolen visits here not matching plans for meeting friends and family. It suits a part of me: the part that leaves worries at the bottom of the water. The other part, that loves this place and bringing others here feels neglectful. This though is not the place to fret. The flock of parakeets that lives on the heath is noisy at first, their bright green feathers striking against the lime, elm and oak trees lining the bank. Then they quieten down, and the only noise I can hear is the churning of water and splash of my arms. As I come to the end of my first lap there is a beating of wings. A heron, like a pterodactyl when viewed from the water, swoops in over the jetty. It looks to land on the diving board then decides against it, and rises and falls as it whirls round to the eastern edge of the water, where it comes to rest by the bushes. The guard notes the arrival of a familiar visitor. I climb out, dive back in and reverse my path round the perimeter. The rain gets heavier as I get out, as always emerging better than when I went in.